Ever read an annotated bibliography? Its not normally thought of as exciting reading by non-researchers. But if you are interested in the works and life of Peter Karl Fabergé this bibliography is worth trying. 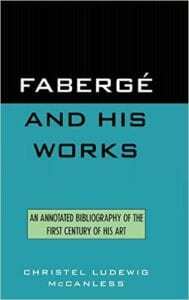 It lists citations of written documents in which Fabergé or his works are mentioned. Each citation is accompanied by a more or less brief paragraph describing the gist of the article. Citations include advertisements, audiovisuals, journals, newspapers and more from before 1920 through 1992. They are arranged by decade so that the annotations become a chronological history of mentions of Fabergé in writing – what artists today call ‘documentation’. The descriptive annotations are good, brief, livened by quotes from the article in question and the rare hint of a personal opinion – this document is about information and it is quite distilled. Interestingly 34% of the citations are from the 1980’s. Fabergé has obviously become more important fairly recently. There are 1772 entries in this book. Now if you are a researcher wanting information concerning Fabergé this book is a must have – no if ands or buts. Because most of the articles cited are accompanied by photographs this book offers researchers a pretty good way of finding pictures of a specific object by Fabergé. A good economic history of the work could be deduced from the text. because of the many mentions of prices. The author also has this bibliography available as a database and it can can be searched upon request, using titles and various keywords. For those salespeople out there one could construct a very knowledgeable front about the subject quickly from the annotations alone. An interesting line in the book is a quote from Dr Marina Lopata of the Hermitage Museum in St Petersburg in 1983 ‘[Fabergé]… is a unique figure who has generated more literature than any other jeweller’. There’s also a note that there exists documentation for some 250,000 objects made by the Fabergé firm. Add to that the fakes floating around and there’s a lot of ‘Fabergé’ work out there, not to mention books and other documentation. There are interesting snippets amongst the annotations, an example being the 85 pound selling price of a Fabergé egg in 1934 in London – the egg had cost 5000 pounds. Kenneth Snowman, (Chairman of Wartski’s) name crops up innumerable times in the citations. He and Wartski’s bought a number of Fabergé items early on for resale and it is possible to see historical echoes of their marketing methods by careful study of the book. A. Kenneth Snowman in fact wrote the introduction to the book. 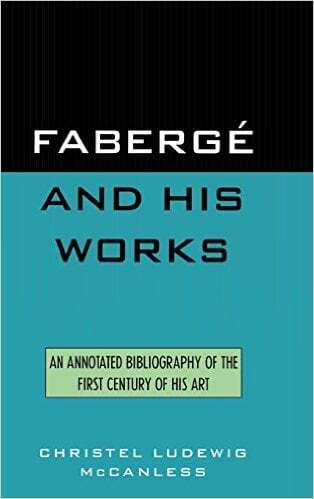 He begins with a statement that there is really nothing new to add to the field on the subject of Fabergé, then continues with notes on his history . Some comments are colorful: ‘The renowned firm of Fabergé was closed down by the Bolsheviks in 1918 and the echo of the brutal slamming of those noble doors in St. Petersburg has reverberated with shame through the years…’ or ‘attempts are being made today to reproduce works in the manner of the master, simply to supply what the perpetrators of these ghastly twinkling corpses in gold and enamel refer to as a market.’. He also calls this bibliography ‘an achievement of immense significance and one which places future scholarship profoundly in her debt.’ which I think may be true. I asked Christine Sammon, Head Librarian at the Alberta College of Art in Calgary to comment on the work as an annotated bibliography. She said that the citation format is correct ‘as it should be – this book has been compiled by a Librarian!’ She personally prefers a slightly different format noting that in this book the citation is in the same body text as the annotation. A bibliography is easier to use if the citation text is bold or otherwise differentiated. She also noted that such a bibliography cannot be all inclusive. It is over 400 pages, has a nice binding with a solid ‘scholarly’ feel to it and is printed on acid free paper – which means it will be around a lot longer than most of the articles cited. There is a what appears to be a very good index at the back of the book. The whole thing is very ‘clean’, no obvious mistakes anywhere. Contents include an introduction, history of the project, major sources, chronology of Fabergé, Fabergé genealogy chart, explanatory notes, journal and newspaper guidelines, glossary, abbreviations and the bibliography. There are some 30 black and white photos of various Fabergés, their buildings, Easter eggs, clocks, stone carvings, a photograph frame, a Tiffany vase with serpent mounts by Fabergé and more. The author Christel Ludewig McCanless is a library consultant with major projects to her credit and has gathered information on Fabergé since the 1960’s. For all those true Fabergé enthusiasts out there, it is a Thumbs Up for this book.